Graham Standish is the pastor of Calvin Presbyterian Church in Zelienople Pennsylvania. He is also an adjunct professor at Pittsburgh theological seminary and Tyndale theological seminary in Toronto. Graham is the author of several books including in God’s presence: encountering, experiencing, and embracing the holy and worship, humble leadership, and becoming a blessed church: forming a church of spiritual purpose, present, and power. What fascinated me about Graham is the way he shepherded his own presbyterian congregation in discernment and a spiritual practices. He transitioned his church from a congregational model to a spirit led model in which everything from Bible studies to committee meetings are shaped not by Roberts rules of order, but by prayerful attentiveness to what the Spirit is saying and doing in every situation. 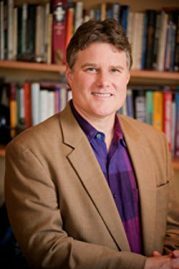 After stumbling accidentally across the presence of Jesus in healing patients at a psychiatric hospital where he served as a therapist, Graham enrolled in a PhD program at Duquesne University, where he studied Christian spirituality from Catholic, Protestant, charismatic, and contemplative traditions. His work and writing is permeated by a deeply Trinitarian theology and a simple confidence that God is at work in every situation and our job is simply to discern and cooperate with his movement. This year, WDA expanded its work in the Philippines on a scale that is somewhat overwhelming, yet very exciting and humbling.. What is most impressive is that it hasn’t even been a full year at all, but rather just 8 months. Since last May our local partners- Sowers of the Word (SOW), The Philippine Bible Society ( PBS ) and The Center for Community Transformation (CCT) have all done amazing work. There have been dozens of training sessions lead by James, Remi, Perry and Dennis which have already resulted in more than 20,000 people participating in small groups. Now that our books are being translated and printed in Tagalog these numbers continue to grow. 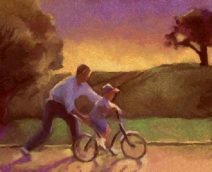 In our most recent conversation with Dennis Monong (CCT Leader) he reported great interest in Life Coaching and Restoring Your Heart this will provide even more opportunities in addition to our established ministries with Cornerstone. As a result of WDA ministry growth and impact, Filipino financial partners have provided donations to hire 2 additional trainers to help with the demand. The overall strategy is to continue to train leaders who begin groups using Cornerstone and follow that initial training with Life Coaching, Restoring Your Heart and Phase III (Equipping for Ministry). A three year plan is in place that addresses publishing, translation, training and leadership development. God has been continuing to build momentum for discipleship in the Filipino church through the ongoing work of our partners and support provided by WDA. The potential impact of our WDA Training, Materials and Philosophy of Ministry should not be over looked. 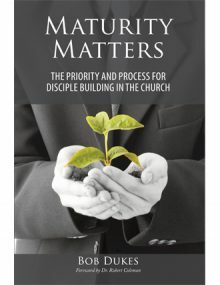 When people understand that our approach to disciple building is not merely curriculum driven but is part of a wholistic approach toward Christlike Maturity, where people “Think, Feel and Act” like Jesus, they begin to ask for more! Significant portions of this trip were designed to live our philosophy of ministry. In addition to training, coaching and teaching WDA staff had the opportunity to live with and among pastors, to visit schools, seminaries, orphanages and factories, to visit over meals, and enjoy one another. The first stage in Disciple building and our R-CAPS model is Relationship! Our time together resulted in many in-depth multi-day discussions about how WDA could have a wholistic impact on the lives of Filipinos. These men, women and children who span the spectrum from extremely impoverished villages and street-dwellers to influential Chinese-Filipino businessmen, have all had just a taste of what WDA has to offer and are eager to continue to know and roll out more. Here are a few of their stories. Just how many miles are you willing to drive to help a small rural church learn about Discipleship? James Tioco drove 15 hours to the northern city of Tuguegarao where he met with leaders who are eager to begin our WDA Cornerstone ministry. These leaders were getting trained following the same orientation program and same material that WDA staff and board members presented last May. The week before our team arrived (January 28, 2017) our friend and brother James Tioco, drove to meet with a group of leaders. James used materials printed by the Philippine Bible Society. They were given our Getting Started/Knowing God (translated into Tagalog) which is now printed in the Philippines as a “flip” book. James also taught from Disciple Building: A Biblical Framework and A Small Groups Manual. Each Training done by Sowers of the Word (WDA Philippines) prepares leaders to start a group themselves with leaders who will often begin a new Cornerstone group in their churches. The goal is not to just learn new information but to begin groups using the curriculum. To date over 300 groups have been started. 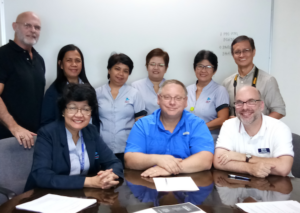 After the 15 hour trip back to Manila James met our WDA team at MGC New Life Christian Academy where David Parfitt, Buddy Eades and Hugh Kirby were to meet with teachers and students. Hugh presented his testimony and we were able to challenge the students to consider how they would be able to disciple others. The staff was so impressed with what they heard that 2 weeks later our team was invited back to MGC Christian Academy to present WDA’s ministry and give them an overview of our materials. Since our return it has been decided they will use our materials in their schools and training has been set up in order for them to begin! WDA leaders met together with the national leaders, who have been part of our ongoing discipleship training since our initial trip in May, for a 2 day Leadership Conference. Keynote speakers, Dr. Ruth Callanta and Dr. Melba Maggay, from the Center for Community Transformation (CCT) taught us the wholistic ministry approach that CCT employes. During this conference Jack Larson, Hugh Kirby (New Hope Church), David Parfitt and Buddy Eades presented an overview of Life Coaching and Jesus ministry as it relates to WDA’s Philosophy of Ministry. Each participant was given a copy of the Life Coaching Manual and learned how to develop a NGP. NGP (Needs Goals Projects) is a Life Coaching disciple building planning tool. 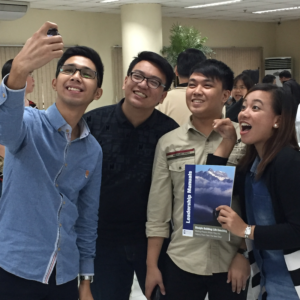 The Philippine Bible Society has become a significant ministry partner. It should not be underestimated what PBS means to the roll out of WDA’s materials and training. PBS hosts local Manila training in their headquarters. PBS is designing, publishing, translating and providing distribution and sales of our materials (both in their book stores and on their web store). They are part of a the International Bible Society and as a result of this relationship they have committed to becoming a conduit for providing our materials and training to other countries where the International Bible Society is located. Each Bible Society has the same capability to print, design, translate and sell our materials. WDA partners in other countries would have the same opportunities as our Philippines ministry is using to provide WDA materials at a low cost with the same quality, consistency and format. The implications would be that WDA has the potential to print worldwide and local churches would not incur shipping costs. WDA has a goal to see people transformed into the likeness of Christ. One worker at a factory run by Center for Community Transformation has seen her life change! “I was once a loudmouth and now I am different because of being part of WDA.” She and her co-workers are part of small groups provided for every worker. These men and women are not just part of groups but also lead groups themselves. Each factory run by CCT has a pastor who oversees discipleship and manages a process that ranges from management all the way to the line worker. Over 20,000 factory workers are now using WDA material in their small discipleship groups. At the CCT Retreat Center in the Tagaytay Highlands we met with leaders from Sowers of the Word, Leaders and Students from Febias Bible College and Seminary as well as Pastors from the Makati Gospel Church. These men and women were able to receive training on the Restoring Your Heart Ministry and also learn more about the Ministry of Christ and Philosophy of Ministry of WDA. All of these leaders were part of previous training with WDA. The benefit of returning to meet with them is that we are able to reinforce the information that they have learned by reading Disciple Building: A Biblical Framework, doing groups using Cornerstone and also by going thru training in small groups using WDA’s A Small Groups Manual. The Pastors for the Makati Gospel Church were looking at using WDA as their main discipleship focus for the church. MGC has many small groups and were looking at many different approaches to discipleship. Our time with them over meals, during meetings and in individual conversations has resulted in them choosing to now only roll out WDA as the main equipping curriculum but also were part of helping us use the Cornerstone in the MCG Christian Academy. MCG Academy will use Cornerstone with 7-12 grade students as well as with faculty. Along with MCG, one of our WDA trainers , Sis. Remi, along with Sis. Joy, Dean of Students at FEBIAS (Far East Bible Institute And Seminary), invited Jack, David and Buddy to meet with students and faculty to introduce our Disciple Building approach. FEBIAS is also looking at WDA as a significant part of student development and small groups at the college and seminary level. The Restorative Ministry also sent a significant team to work with Rich Smith, WDA Staff member in Quezon City, Philippines. 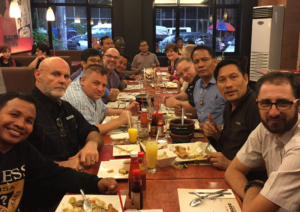 Rich has been in Quezon City developing a ministry with local pastors who have been very interested in starting Restoring Your Heart groups. The RYH team led 6 trainings over a 3 week period for people who were committed to start RYH groups. The challenges that face WDA with these prototype groups are providing ongoing feedback and training while receiving feedback about how the experience is going. WDA will use the feedback with these leaders and also with groups started by Sowers of the Word to begin a national strategy this coming year. In addition to Quezon City groups, 3 more groups have begun with Leaders at the Makati Gospel Church, the Philippine Bible Society and at FEBIAS. What we see in these stories is but a small number of ways WDA is becoming a Worldwide Discipleship Association. WDA has a commitment to serve the Church Worldwide. Ministry partnerships around the globe will have ongoing impact as WDA provides the training, service and materials necessary to begin national movements where people grow to maturity. We would greatly appreciate your prayers and financial support in making these endeavors possible. 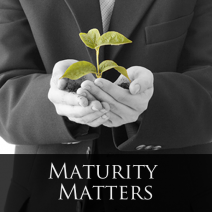 “Most current approaches for helping Christians grow to maturity aren’t working. Many church leaders realize something is wrong but don’t know how to correct the problem. A shift may have started, but old traditions persist. Alister McGrath recognizes that we need a better strategy. I’m convinced that most church leaders are sincere, zealous followers of Christ, committed to helping people grow in Him. They’ve given their lives to Christ and His agenda. The problem doesn’t lie with their passion for God. Instead, it comes from their failure to have a strategic plan that produces maturity and has a practical use in their church. 14. Alister McGrath, Spirituality in An Age of Change: Re-discovering the Spirit of the Reformers (Grand Rapids: Zondervan Publishing House, 1994), p.9.